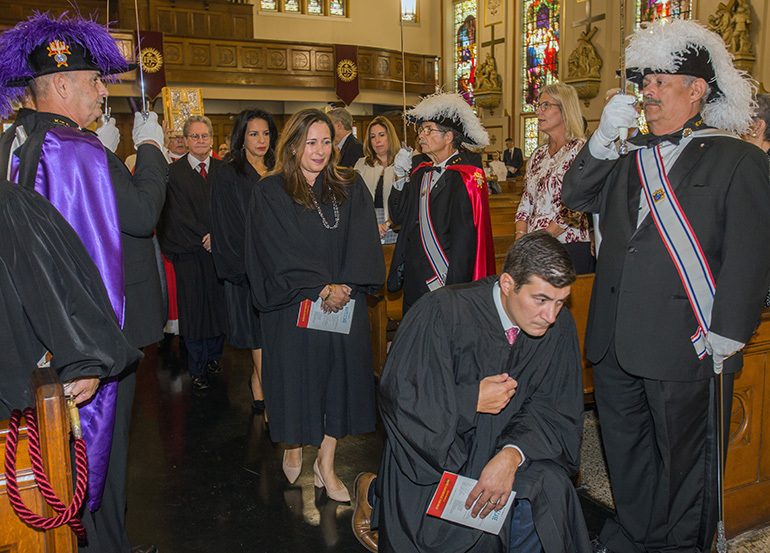 Circuit Court Judge Rodolfo Ruiz genuflects before the altar as Circuit Court Judges Monica Gordo, Beatrice Butchko and John Thornton walk behind him and Knights of Columbus Council 3201 honor guard line the aisle. 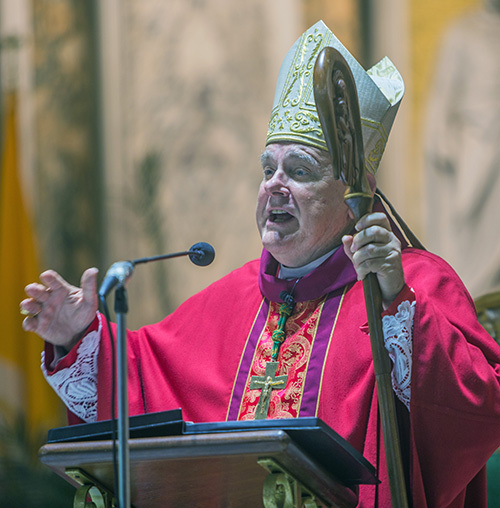 Archbishop Thomas Wenski preached this homily during the annual Red Mass with members of the Miami Catholic Lawyers Guild, and other legal professionals, gathered at Gesu Church in downtown Miami. The Mass was celebrated Oct. 4, 2018. We gather at this annual Red Mass to invoke the Holy Spirit promised by Jesus to his followers. We pray today for a renewed outpouring of his gifts upon the members of the bar. We do so during a difficult time – a time of increasing polarization and mistrust – both in our national as well as in our ecclesial life. More than ever we need the gifts of the Holy Spirit and the fruits of the Spirit to bring us to true wisdom – and healing. On this, the feast of St. Francis de Assisi, we make our own his prayer. We ask that we be instruments of the Holy Spirit’s peace, sowing love where there is hatred, pardon where there is injury, faith where there is doubt, hope where there is despair, light where there is darkness, and joy where there is sadness. Archbishop Thomas Wenski delivers his homily during the annual Red Mass of the Holy Spirit with members of the Miami Catholic Lawyers Guild, Oct. 4, at Gesu Church, Miami. In the confirmation ritual, the Holy Spirit is referred to as the Paraclete, a word borrowed from the Greek, Paracletos. In the Gospel according to St. John, which was originally written in Greek, Jesus refers four times to the Holy Spirit as Paracletos. I try to take care to pronounce “paraclete” carefully; but I am sure that the kids –and their parents – hear parakeet. This Greek word – paracletos, not parakeet – can be translated as Counselor, Advocate, Helper and Comforter. Literally it means “one called alongside of” to aid, exhort and encourage. Nor should we be surprised that lawyers – both defenders and prosecutors – and judges should feel the need to invoke the help and encouragement of the Holy Spirit as they carry out their duties as officers of the court: for you are Counselors, Advocates, Helpers and Comforters as citizens navigate their way through our legal system. Our legal system recognizes the rights of the individual to seek redress for grievances while at the same time affirming the presumption of innocence. These principles undergird our American system of justice and due process. As Americans we are ruled by law – not by despots or by mobs. By praying for you today, we honor your noble vocation – and your dedication and devotion to the rule of law. But, as I said, we are living in a difficult time. Some have described our time as being not so much an era of change but the change of an era. One of the signs of the time is that society’s institutions are being called into question. Certainly, these institutions have been undermined to one extent or another because of corruption and greed, because of the abuse of authority and power. Positions of service are turned into instruments of personal gain. We see this in politics, we see this in academia, in the press, in the entertainment world, in business – and certainly we have seen this in the Church. And your own profession has not been immune. For these reasons and others that have yet to be well articulated, people are increasingly addicted to “outrage.” In fact, the internet and cable news support a whole industry devoted to “outrage” — which could be defined as talk designed to provoke emotional responses — anger, fear, moral indignation among others. This “outrage industry” is sustained by overgeneralization, sensationalism, inaccurate information and “ad hominem” attacks. Oppositional research designed to uncover dirt about an opponent is seen as a legitimate tactic in the “contact sport” that is today’s politics. Bloggers use “outrage” as click bait and those talking heads on cable TV exploit it as a strategy to increase audiences and therefore their advertising revenue. Debate and argument is replaced with shrill polemics, polemics that generate little light but much heat that feeds the outrage. But if we allow ourselves to be blinded by outrage, justice will no longer prevail. If we discard due process, then a benighted tribalism will inevitably overtake us. Without reference to a common truth "derived from the Laws of Nature and Nature's God" people feel set adrift — and this is the reason for their outrage which is, in many ways, a projection of fear. When a democracy bases itself on moral relativism and when it considers every ethical principle or value to be negotiable (including every human being's fundamental right to life), it is already, and in spite of its formal rules, on its way to totalitarianism. The might of right quickly becomes might makes right.